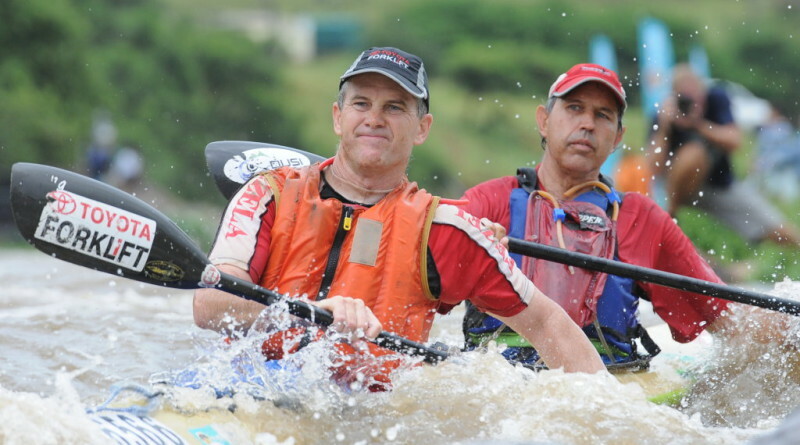 49 year-old Pietermaritzburg paddler Eric Bothma will end his awe inspiring record of having completed every Non-Stop Dusi Canoe Marathon due to a recent hip operation and predictions that Friday’s race is likely to be the toughest ever in the 20 year history of grueling challenge from Pietermaritzburg to Durban. Bothma – the only man to have successfully tackled all nineteen previous Non-Stop Dusis – was set to become the first to twenty finishes however for the first time ever he will not be on the start line. “I’m confident that if I started this year’s race, I would finish it and my wife has been saying to me ‘just don’t regret your decision’; my heart has been saying yes but in the end my brain has said no, and I’m at peace with that. “Even though I’ll be at the start to see the guys off, I’m certainly going to miss being a part of the racing on Friday and it will be rather sad for me, but sometimes these things happen. With the desperate desire to still give the challenge a go, Bothma had given himself a final, backdoor opt in scenario however sadly Mother Nature has not played ball in the week leading up to the race. “Because of my operation, I wasn’t able to train enough and so my game plan was that if there was a change in the weather and we had some rain before Friday, then I might reconsider and still paddle. “We haven’t though, there isn’t any rain predicted by the long term forecast and it is probably going to be extremely hot which, when all put together, ultimately made up my mind. “Twenty consecutive Non-Stop Dusis obviously would have been an amazing record to have held, but really, at the end of the day, whether it is twenty in a row or nineteen doesn’t really matter to me. “This is also by no means the end for me; come Hell or high water, next year I will definitely be back and hopefully I will become the first ever to finish twenty Non-Stop Dusis then! Bothma considers himself fortunate to have enjoyed such an extended run of health that has allowed his uninterrupted Non-Stop Dusi participation for so long and in conditions ranging from flooded conditions to tough, low river slogs. “I’ve been extremely fortunate to have done nineteen Non-Stops in a row, on top of my 28 Dusis! “I’ve done a very low Non-Stop Dusi before – and I’m sure if I started this year, I would finish – but I was a good twelve or so years younger and that year was the longest I have ever been out there for! “In the past, when there hasn’t been much water, it usually hasn’t been all that hot or when it has been very hot then at least we’ve had water. “This year looks like the guys are going to have to deal with both though! “This race in the best of water conditions and weather is incredibly tough, there simply is nowhere to hide; this year will however be even tougher and the stretch from Inanda Dam to Durban is simply going to be horrific! “I hope for the sake of the guys who are there on Friday that our predictions are wrong, but unfortunately I think anyone who achieves this year’s t-shirt is certainly going to have earned it!” said Bothma. The 2016 Non-Stop Dusi Canoe Marathon starts at Camps Drift, Pietermaritzburg at 05h30 on Friday, 4 March with the leaders expected to arrive at the finish at Blue Lagoon, Durban at approximately 13h00.